The to be proclaimed President of the Philippines has not decided yet to give any cabinet post for the incoming vice-president of the country. Rodrigo Duterte said on Sunday, May 29, that he was more worried for his friends place than to Leni Robredo. According report by ABS-CBN News, Duterte said, "Why should I talk to her? I have not considered anything for her because I’m more worried where I would place the friends na nagkautang ako ng loob." Rody Duterte and Leni Robredo, are set to be proclaimed winners of the May 9 elections on Monday. They both come from opposing parties. "I should not be looking beyond my borders yet," Duterte added. On the other hand, Leni expressed her willingness to work with Duterte. She said, "Oo naman po, Klarong klaro po na 'yung taumbayan, talagang binigay 'yung mandato sa ating susunod na pangulo, kay Pangulong Duterte. Obligasyon ko po hindi lang bilang susunod na pangalawang pangulo." According to the final tally in congress, Leni Robredo garnered a total of 14,418,817 votes while Marcos had 14,155,344. Robredo led Marcos by only 263,473 votes. On Duterte's interview on Sunday, he was asked why he was putting a premium on friendship over qualifications in choosing cabinet secretaries. He said, "Ang mga kilala ko, mga brod ko at yung mga kababata ko dito na mahusay." Based on the news source, Duterte has chosen long-time Davao friends Carlos Dominguez as finance secretary and Jesus Dureza as presidential peace adviser. 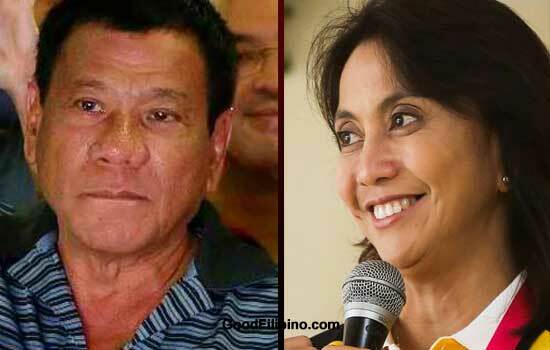 What do you think will be the final decision of President Rody Duterte for Leni Robredo's cabinet post? Please point your thoughts below. Comments or suggestions about "Duterte on Leni's Cabinet post: 'I have not considered anything for her'" is important to us, you may share it by using the comment box below.